I’ve been gone for a long time, and I’m very sorry I’ve had to take an unscheduled break from blogging. It’s been a very hectic time at work and then I became sick with a nasty cold (which I’m still recuperating from). The good news is that tomorrow is Daredevil day! Yep, Daredevil #7 is out in stores tomorrow and if you’ve still got some seasonal shopping to get to, why not buy an extra copy for a friend or relative who might need some Daredevil awesomeness in their lives? Meanwhile, what else is new? Well, New Avengers #19 by Brian Michael Bendis and Mike Deodato, featuring Daredevil, came out last week. 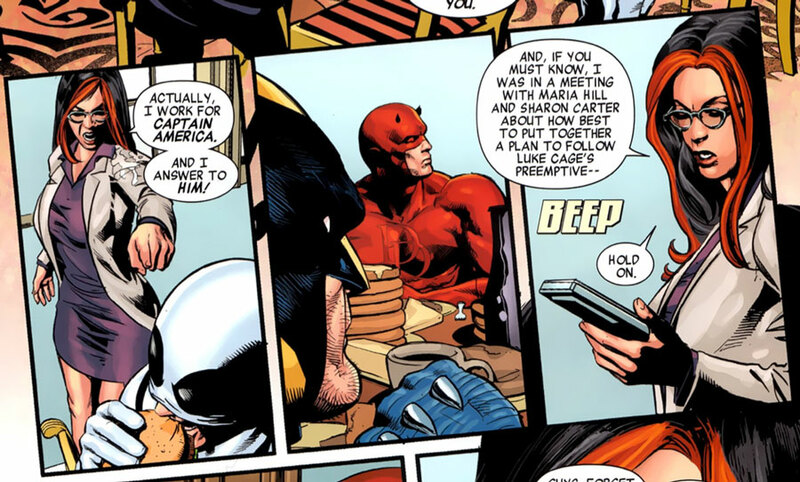 It starts with a longer, semi-entertaining scene between Daredevil and Squirrel girl that shows Daredevil showing up too late to go with the others on their mission (for which he didn’t actually get a call). Toward the end, Daredevil is back, this time eating what looks like pancakes with the rest of the team before they’re called away again. I can’t really get too excited about this book, despite Daredevil being in it, so I’m sorry I didn’t give it a proper review. Obviously, this arc deals with Norman Osborn re-appearing and setting up a new team of Dark Avengers, but they haven’t come into contact with Daredevil and the others just yet. I suspect things might get more exciting down the line, though. We’ve also seen Marvel release the full solicitations for March, including those for Daredevil #10 and the Season One: Daredevil graphic novel by Antony Johnston and Wellinton Alves. Season One will apparently be 136 pages long and will also include a reprint of Daredevil #1 (volume 3) though I’m not sure whether that’s in addition to the listed page count. As for Daredevil #10, we learn that Matt’s façade will start to crumble and that sounds like an interesting development to me. I’m guessing I’m not the only one who’s absolutely in love with Paolo Rivera’s gorgeous cover for this issue, and those who’d like some insight into how it was made, I recommend this time-lapse video by The Comic Archive that Paolo posted to his blog. Actually, there is a neat scene where it seems DD has clued in to some sort of deception on Hand’s part…that even Wolverine did not pick up on. I know a lot of people aren’t hot on Matt being on the Avengers, but I think it is neat. I didn’t have a problem with Daredevil joining the New Avengers, though it seems that in today’s Marvel Universe, just about everyone is an Avenger of some sort, diluting the “honor”. The problem I have is that it accomplished so little. What’s the point of having Daredevil on the team? Why would he be on the team but the rest of the FF wouldn’t? Or Cloak & Dagger? Or Echo? It feels a bit like Matt might be on the team just to provide a human lie detector to catch Victoria Hand, as Eric implicitly suggests above. It isn’t helping things that I haven’t found NEW AVENGERS particularly enjoyable since, I think, issue #8. Fear Itself was a bore and the current H.A.M.M.E.R. story feels like the exact same story that I read over and over again pre-Siege. Bendis, use a villain who’s not Norman Osborn or the Hood! I dropped AVENGERS a year ago; I’m only keeping this on my pull list because I can’t bring myself to ignore Dr. Strange appearances.